Look deeeep into my eyes. You are getting stuuuupid. Despite earning near-universal condemnation from actual experts, Representative Alexandria Ocasio-Cortez (D-NY) is sticking with her “Green New Deal.” Ocasio-Cortez promises it will make the world a just and fair place, in which the poor are enriched, the weak empowered, the sick well, the fat thin, and the dumb smart; never mind that the colossal word salad reads like a middle-schooler’s book report on the Communist Manifesto. With the stated goal of eliminating so-called “climate change,” the “Green New Deal” isn’t just bananas, it’s the whole damned jungle. 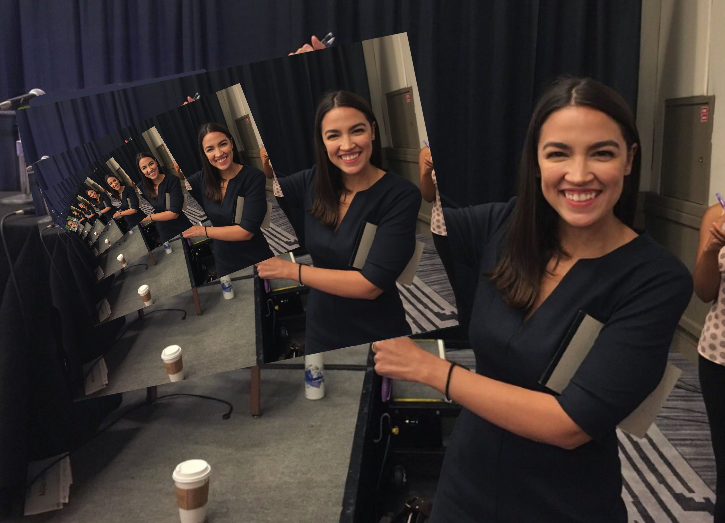 In addition to the usual liberal heavy breathing about universal access to “high quality healthcare,” “high-quality education,” “healthy food,” and “retirement security,” the Green New Deal will require – not ask, require – the federal government to transform into an all-consuming entity that would have given Pol Pot a case of the willies. More to the point, it is so, so, dumb. 2 It will empty the fridge. Since the internal combustion engine is one of the principal offenders in the “climate crisis,” the Green New Deal will purge it from existence, or “build out high-speed rail at a scale where air travel stops becoming necessary, create affordable public transportation..with goal (sic) to replace every combustion-engine vehicle.” In case walking to the store doesn’t sound like enough fun, with no more machines to help with growing, harvesting, and hauling stuff, there won’t be anything on the shelves. From Twinkies to tomatoes, if it involves mass production or preservation, it’s verboten. And what food there is will get less plentiful, and less fun to produce. Check the history books for an idea of what farming was like before – say – the cotton gin. 3 It will require the demolition or reconstruction of virtually every standing structure in the United States. One of the Green New Deal’s “14 infrastructure and industrial projects” would require Americans to “upgrade or replace every building in the US for state-of-the-art energy efficiency.” According to the US Census Bureau, there are approximately 138,000,000 housing units in the United States. The US Department of Energy estimates around 6 million commercial buildings. That’s a lot of upgrading or replacing. The Green New Deal commands construction of “green” buildings at a pace of around 400,000 per day. Thanks to the ban on internal combustion engines, those structures will all have to be constructed with hand tools. At least the full employment promises are for real. 4 It’s a giveaway to Big Labor. I hope the facts about what the Green New Deal will do to farming and construction don’t scare you too much, because you may well up farming or building. And it looks like you would have to pay for the privilege. The resolution requires “all GND jobs to be union jobs.” If you want to pick cotton, you’re going to have to join the International Brotherhood of Cotton-Pickers, or whomever. I don’t know what they give you when you retire, but since life expectancy for cotton-pickers has been traditionally low, I wouldn’t sweat it. 5 It will bankrupt the Nation, and its authors know it. They even admit it. “Even if every billionaire and company came together and were willing to pour all the resources at their disposal into this investment, the aggregate value of the investments they would make would not be sufficient.” As Ocasio-Cortez herself is fond of pointing out, billionaires and corporations have either direct or indirect control of an enormous percentage of the Nation’s wealth. As she’s less fond of pointing out, they also happen to pay an enormous percentage of the taxes. If your plan acknowledges they don’t have enough, combined, to foot the bill, then your plan has a bigger gap in it than the one in AOC’s education. The Green New Deal promises to cover the shortfall with “quantitative easing” and “credit.” Printing more money and creating more public debt won’t make America “green;” it will make America Venezuela. 6 It compares itself to the moon landing. “When JFK said we’d go to (the moon) by the end of the decade, people said it was impossible.” Right, getting a couple of guys to jam into a rickety tin can atop an ICBM in a gamble - one that produced malfunctions and dead bodies at only a slightly lower rate than small steps for mankind - is just like sending the US back to the 1820s because the global warmists are getting nervous. 8 It can’t work. It can’t even be implemented. In fact, it obviates itself. The entire Green New Deal rests on the development of new technology, some of which it admits doesn’t exist yet. It bans fossil fuels and internal-combustion engines but requires massive tech advances. Massive tech advances can't happen without plastics and miniaturization. And plastics and miniaturization can't happen without fossil fuels and internal-combustion engines. It’s a communist cul-de-sac, and it should stay there. When it runs up against scientific issues, the Green New Deal offers “plant lots of trees.” When it stumbles over logistical obstacles, it promises to “build charging stations everywhere.” Even House Speaker Nancy Pelosi (D-CA) called it a “dream.” It’s a socialist’s term paper, not a serious piece of legislation.